In 1996, members of the North American Militia (NAM) devised a plot to spark a nationwide militia uprising by killing government officials and attacking government and infrastructure targets in Michigan. Members planned to finance their activities by robbing narcotics traffickers or engaging in narcotics distribution. An undercover ATF agent infiltrated the group and learned it was making homemade C-4 explosives, stockpiling PVC pipe bombs and had acquired .50-caliber machineguns with 20,000 rounds of belted ammunition. Theoretically, when the war began, NAM member cells would receive coded messages instructing them to attack a particular target. CAR-15 Rifle: Similar to those used by militia members. Militia Patch: Insignia worn by members. Pipe Bomb (Inert): Similar to the devices constructed by militia members. 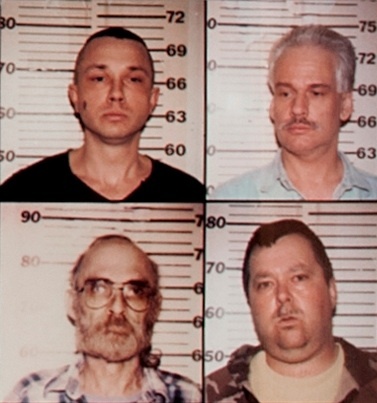 In 1997, ATF, the Federal Bureau of Investigation and the Michigan State Police executed federal search warrants on four NAM leaders, seizing numerous firearms, including machineguns, belted ammunition, a .50-caliber sniper rifle, bomb-making material and other incriminating evidence. Four defendants were later convicted for federal crimes involving firearms, possession of destructive devices, conspiracy and narcotics violations. Sentencing ranged from five years to 50 years imprisonment.